Chris Wilberts of Radio Holland and Bruce Murray of Station KLC. Radio Holland USA, B.V., one of the nation's largest distributors of advanced communications and nav- igational equipment, recently had a "hands-on" private exhibition of their Total Shipboard Communica- tions Center at the Houston head- quarters complex. Attendees at the three day session included a wide range of technical and operational personnel from the shipping and marine electroncis industries. Ac- cording to Sal Berte, general sales manager of Radio Holland, the pro- gram was planned to provide poten- tial customers with an opportunity to see the most modern equipment live in a real-life environment. Among the equipment on display was Radio Holland's new FCC type approved TR 4750 survival craft/ lifeboat radio. This ultracompact system transmits on the 500, 2182 and 8364 kHz international distress frequencies, and meets all current applicable SOLAS, ITU and FCC requirements for two-way commu- nications. For use on 500 and 8364 kHz, the TR 4750 incorporates an automatic switching and automatic keying device which transmits the radiotelegraph distress signal on both frequencies, as well as the DF dash on 8364 kHz. A built-in two- tone generator provides automatic transmission of the radiotelephone alarm signal on 2182 kHz. The unit will operate either from an external 24 VDC battery or from the built-in hand-cranked generator. RT 146; plus Sailor's new CRY 2001 compact scrambler that permits up to 16.8 million possible code combi- nations for the ultimate in commu- nications security. Aalborg, Denmark, in a modern fac- tory capable of producing in excess of 20,000 sets annually. The compa- ny's product line has become known worldwide both for reliable opera- tion and the distinctive green finish that provides a nylon finished, scratch-free surface that is highly resistant to salt water. The Program 1000/B short wave communications system is able to meet all maritime communications needs in the frequency range from 1.6 to 27.5 MHz due to the unusual design flexibility. A variety of re- ceivers, transmitters, exciters and power supplies can easily be mounted in the Sailor 19" rack to satisfy the communications require- ments of every size vessel. In addi- tion, the antenna coupler can be mounted directly at the foot of the antenna for maximum efficiency. The system can also operate under full remote control to meet the requirements of an automated ra- diotelex station. In the ARQ mode, the system works through a single antenna and has switching speed sufficient for telex operation over a single simplex frequency. Program 1000/B is the Nordic Mari- tex Terminal. 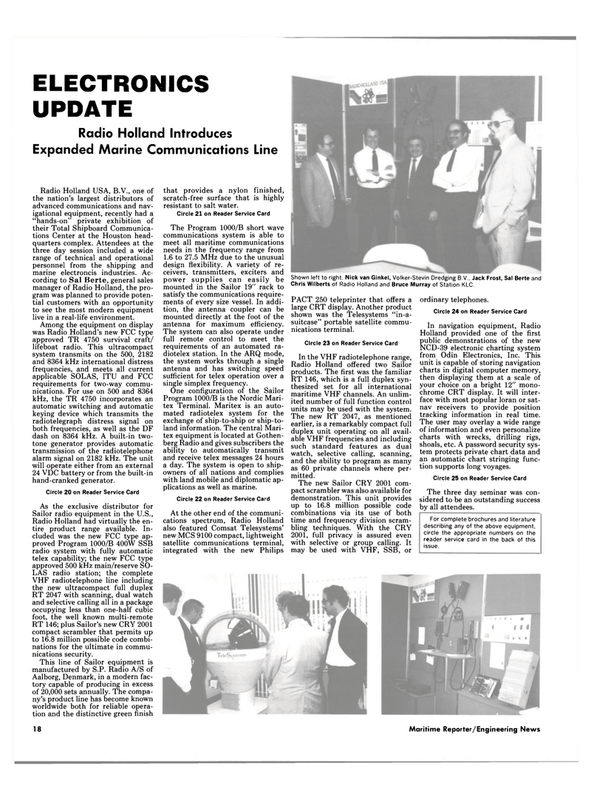 Maritex is an auto- mated radiotelex system for the exchange of ship-to-ship or ship-to- land information. The central Mari- tex equipment is located at Gothen- berg Radio and gives subscribers the ability to automatically transmit and receive telex messages 24 hours a day. The system is open to ship- owners of all nations and complies with land mobile and diplomatic ap- plications as well as marine. PACT 250 teleprinter that offers a large CRT display. Another product shown was the Telesystems "in-a- suitcase" portable satellite commu- nications terminal. RT 146, which is a full duplex syn- thesized set for all international maritime VHF channels. An unlim- ited number of full function control units may be used with the system. The new RT 2047, as mentioned earlier, is a remarkably compact full duplex unit operating on all avail- able VHF frequencies and including such standard features as dual watch, selective calling, scanning, and the ability to program as many as 60 private channels where per- mitted. The new Sailor CRY 2001 com- pact scrambler was also available for demonstration. This unit provides up to 16.8 million possible code combinations via its use of both time and frequency division scram- bling techniques. With the CRY 2001, full privacy is assured even with selective or group calling. It may be used with VHF, SSB, or ordinary telephones. NCD-39 electronic charting system from Odin Electronics, Inc. This unit is capable of storing navigation charts in digital computer memory, then displaying them at a scale of your choice on a bright 12" mono- chrome CRT display. It will inter- face with most popular loran or sat- nav receivers to provide position tracking information in real time. The user may overlay a wide range of information and even personalize charts with wrecks, drilling rigs, shoals, etc. A password security sys- tem protects private chart data and an automatic chart stringing func- tion supports long voyages. The three day seminar was con- sidered to be an outstanding success by all attendees.